Former Ipswich mayor Paul Pisasale has been arrested on Tuesday after appearing in Brisbane for questioning by the Crime and Corruption Commission. "All my life people know that I've fought for Ipswich, that I've fought for fair, and I'm going to continue to do that", he said. Pisasale said his situation "would be a worrying time for anybody but the most important thing is to deal with it and deal with it properly". Mr Pisasale was known as "Mr Ipswich" after becoming one of the city's most readily identifiable figures. The barrister said he had asked Mr Pisasale to fly the cash to Brisbane "as a friend", and arranged for the money to be delivered to the hotel. 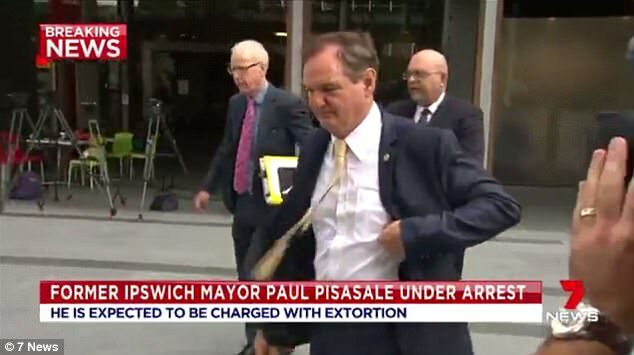 EMBATTLED former Ipswich mayor Paul Pisasale spent last night locked up after an anti-corruption investigation took a dramatic new twist. In court, the former mayor was dressed in a standard-issue brown tracksuit and sat with his head down in the dock for much of his hearing. Pisasale had been mayor since 2004 after first being elected to council in 1991. After a 45-minute hearing, Pisasale was granted bail on the condition he stay away from worldwide departure points and not contact witnesses. Deputy Chief Magistrate Terry Gardiner granted him bail after hearing a police objection to his release and reading documents relating to the case, which he ruled could not be published. Pisasale's passport has been surrendered.